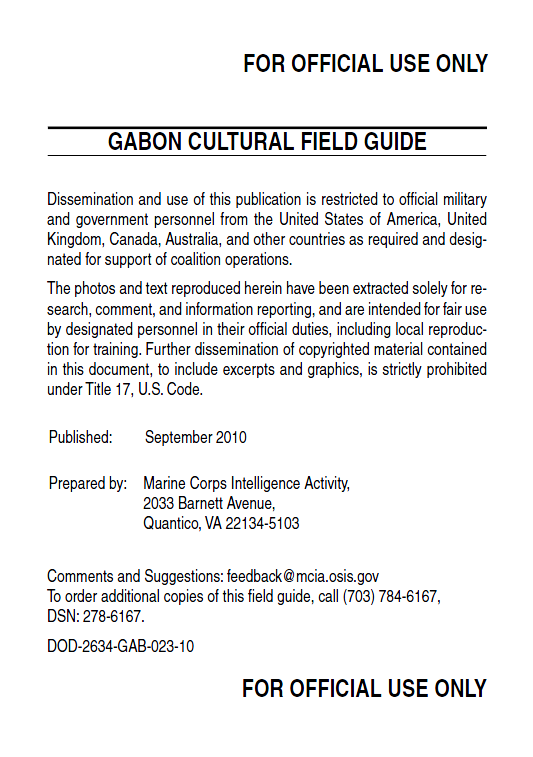 The field guide presents background information to show the Gabon mind-set through its history, language, and religion. It also contains practical sections on lifestyle, customs and habits. For those seeking more extensive information, MCIA produces a series of cultural intelligence studies on Gabon that explore the dynamics of Gabon culture at a deeper level. Gabon is a small country roughly the size of Colorado (268,000 square kilometers) located along the Gulf of Guinea in Central Africa. Gabon borders Equatorial Guinea and Cameroon to the north and the Republic of the Congo to the south and east. The climate in Gabon is typical of an equatorial zone; temperatures are hot, and the air is humid during the rainy season. During the dry season, the air is dryer and cooler with overcast skies. The rainy season typically occurs from September to January and February to June. The dry season lasts from June to September, with a shorter dry season in January and February. Gabon is one of the most sparsely populated countries in Africa, with a population density averaging less than five people per square kilometer. According to official estimates, Gabon is home to 1.3 million people and has an annual population growth rate of 2.5 percent. Gabon’s gross domestic product (GDP) is US$60 billion annually, four times greater than the regional average; however, this benefits only a small percentage of the population. The high GDP makes Gabon ineligible for many international aid programs, despite the fact that many Gabonese live in poverty and have a relatively low life expectancy. More than 40 different ethnic groups live in Gabon. All Gabonese ethnic groups speak Bantu languages with the exception of some Pygmy groups. Communities of hunters and gatherers (also known as Pygmies in English, or Batwa in Bantu languages) in Gabon have close relationships with neighboring farm communities and are increasingly settling into permanent villages. The largest ethnic group is the Fang (pronounced “Fawn’g”), a Bantu-speaking group. Authoritarian government and centralized power: Since Gabon was granted independence in 1961, only three men have served as president. The most significant of these was El Hadj Omar Bongo Ondimba, who ruled for 42 years (1967–2009). Bongo established an authoritarian government with centralized power. Rural populations and members of the opposition have struggled to achieve meaningful changes in the government. In September 2009, Bongo’s son Ali Ben Bongo Ondimba succeeded him. Urbanization: During the colonial era and in the past several decades, Gabon has experienced rapid urbanization. The movement of large numbers of people to urban areas is undermining traditional ethnic, clan, and regional ties. At the same time, new social networks are forming based on shared urban experiences. Petroleum industry: Gabon’s GDP and national budget are almost entirely funded by the petroleum industry. Petroleum supplies and revenues have begun to decline in recent decades. It is unclear how Gabon will respond to the loss of this source of financing, although several government projects aimed at filling this gap have been debated since the 1990s. Poverty: Although Gabon has an educated and affluent elite, most Gabonese live in poverty. There is a large divide between the rich and poor in Gabon, as well as between urban and rural populations. Importance of ethnic and clan ties: Although urbanization is creating new social networks, clan and ethnic ties help many Gabonese succeed in modern life. Ethnic identities assumed political significance during the colonial era. Today, clan and ethnic affiliations may help a Gabonese citizen secure a job or political support. Western influences: Gabon has been heavily influenced by colonialism and French culture. Today, external influences continue to be important. Many Gabonese are open to Western, particularly American, culture. Xenophobia: Always distrustful of outsiders, the Gabonese are becoming increasingly xenophobic and resentful of foreigners. They particularly resent illegal immigrants and migrants from West Africa and Lebanon, who reside in large numbers in urban areas. Clothing or other aspects of a person’s appearance do not indicate what ethnic group the person is from. There are no major differences in clothing styles among ethnic groups. Also, most of the ethnic groups in Gabon share physical characteristics. Pygmies also look similar to other groups, though they are sometimes of smaller stature. Pygmies will likely not be present in urban areas. However, clothing or other aspects of appearance can indicate what social class a person is from. Affluent citizens and members of the government will most likely dress in expensive suits or finely tailored dresses made from African-style material. Middleclass Gabonese often dress in Western-style clothing such as blue jeans and T-shirts. Clothing made from brightly patterned African cloth is also very popular and may be worn by people of all social classes, but mostly by women. The Gabonese show their generosity to guests by serving large portions of their best meals. Prestigious guests are offered multiple dishes to choose among. In addition, the amount of protein (e.g., meat or fish) that a Gabonese family is able to serve indicates wealth and prestige. When hosting prestigious guests, the Gabonese will serve as much meat and fish as they can. Often, this means they will serve far more meat and fish than they would be able or willing to serve at a regular family meal. Some of the protein might be local “bush meat,” such as forest antelope, monkeys, porcupines, and forest pigs. Staple foods that the Gabonese serve include cassava loaves, plantains, white rice, soup (typically includes a sauce and a meat, for example meat in a tomato sauce or peanut sauce with vegetables), and manioc leaves and smoked fish.